In this paper we evaluate the usability and performance of Open Computing Language (OpenCL) targeted for implementation of the Finite-Difference Time-Domain (FDTD) method. The simulation speed was compared to implementations based on alternative techniques of parallel processor programming. Moreover, the portability of OpenCL FDTD code between modern computing architectures was assessed. The average speed of OpenCL FDTD simulations on a GPU was about 1.1 times lower than a comparable CUDA based solver for domains with sizes varying from 503 to 4003 cells. Although OpenCL code dedicated to GPUs can be executed on multi-core CPUs, a direct porting does not provide satisfactory performance due to an application of architecture specific features in GPU code. Therefore, the OpenCL kernels of the developed FDTD code were optimized for multi-core CPUs. However, this improved OpenCL FDTD code was still about 1.5 to 2.5 times slower than the FDTD solver developed in the OpenMP parallel programming standard. 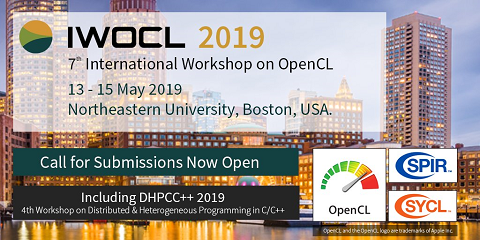 The study concludes that, despite current performance drawbacks, the future potential of OpenCL is significant due to its flexibility and portability to various architectures.